Launching PSYCHOLOGY APPRECIATION WEEK (PAW)! Yes! It’s coming back and it’s bigger than ever! Lauching our new event: PSYCHOLOGY APPRECIATION WEEK! 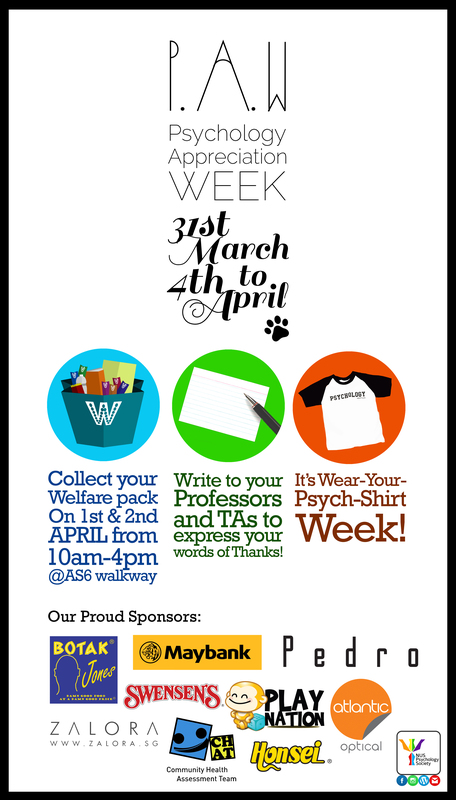 This event will combine our Welfare Pack Distribution (yes mark down 1st and 2nd April on your calenders) as well as our Wear-Your-Psych-Shirt Event, which is now extended to last throughout the week! So do wear your Psych Shirt next week! Also, following last semester’s small pilot initiative, you would also be able to write Notes-of-Thanks to all your beloved professors and teaching assistants! So do come down to the booth located along the AS6 walkway next week to participate in this meaningful event! Here’s a full list of our proud sponsors for this semester’s welfare pack distribution! NUS Psychology Society would like to thank them for their kind support.